It's been one hell of a good week and sleeping in today was just the cherry on top. I decided to not be so lazy this morning and actually make something extra noms to eat. There are few sins I find more unforgivable than a badly poached egg. So while I'm rarely that painstaking patron that sends back food due to minor details, if I order eggs Benedict and get a hard boiled egg on top of a tomato, that sucker is going back. Brunch today included applewood smoked bacon, poached eggs (topped w/ garlic leaves) over smoked salmon and heirloom tomatoes. 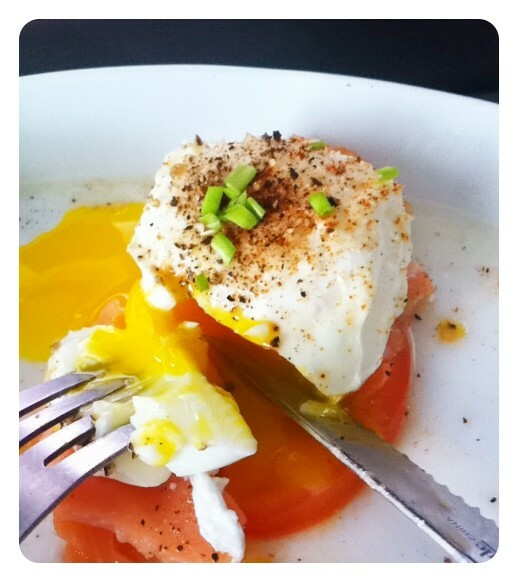 My only regret was not drizzling truffle oil over the tomatoes and using black truffle salt on the egg. C'est la vie, it was still yummy in my tummy. I've been quite the bad blogger because crossfit, work and travel have been consuming me this past month. Here are some birthmonth highlights to get you caught up. May was a good month, as always.